Sorkin tells TVGuideMagazine.comthat – like his previous series Sports Night (set around an ESPN-style sports news show) and Studio 60 on the Sunset Strip (set around a Saturday Night Live-esque sketch comedy show) – his next effort will take place backstage on yet another TV series. I hope that whatever type of TV show it is set in lends itself to considering political issues. 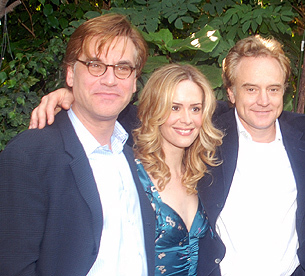 Watching Studio 60 I often felt that Sorkin would have preferred writing The West Wing. Nancy Pelosi clearly knows far more than I do about getting bills passed. It is certainly possible that she knows what she is doing in attaching the Stupak Amendment to health care reform. Maybe this was necessary for initial passage in the House and maybe she has reason to be certain that a final bill will be passed without such restrictions on abortion rights. We won’t know until we see how this all plays out but I consider to fear she made a huge mistake. A new study by the George Washington University School of Public Health and Health Services adds some expert imprimatur to what many progressives have been saying all along: The Stupak amendment to the House health care bill–which will prevent millions of women from buying health insurance policies that cover abortion–is likely to have consequences that reach far beyond its supposedly intended scope. In other words, though the immediate impact of the Stupak amendment will be limited to the millions of women initially insured through a new insurance exchange, over time, as the exchanges grow, the insurance industry will scale down their abortion coverage options until they offer none at all. It is disappointing that the Democrats have so far voted for a bill which contains such an amendment. This is about the fundamental right of a woman to control her own body. Democrats should not be willing to compromise over such fundamentsl rights. Rather than compromising, they should have spoken out against this attempt by Republicans to control health care and interfear in the decisions made between a patient and her doctor. The Republican Party in recent years has become the organ of an authoritarian movement. The Democrats need to present a clear alternative to their views, not compromise over basic rights. Offering a clear voice in support of individual liberty, on abortion rights as well as other issues where the Republicans desire increased government intervention in the lives of individuals (despite their hypocritical adoption of the language of liberty), might also give independents a reason to stick with the Democrats. If the Democrats fail to offer a clear contrast between themselves and the Republicans we are likely to continue to see stories about the loss of independent support.